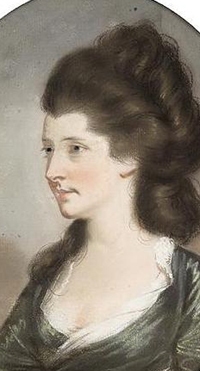 Catherine Hall was the daughter of Roger Hall and Catherine Savage.2 She married Rt. Hon. William Brownlow, son of William Brownlow and Lady Elizabeth Hamilton, on 23 November 1765. She died in 1843. Judith Letitia Meredyth was the daughter of Very Rev. Charles Meredyth. She married Rt. Hon. William Brownlow, son of William Brownlow and Lady Elizabeth Hamilton, on 25 May 1754. She died in October 1763. Very Rev. Charles Meredyth lived at Newtown, County Meath, IrelandG. [S6] G.E. Cokayne; with Vicary Gibbs, H.A. Doubleday, Geoffrey H. White, Duncan Warrand and Lord Howard de Walden, editors, The Complete Peerage of England, Scotland, Ireland, Great Britain and the United Kingdom, Extant, Extinct or Dormant, new ed., 13 volumes in 14 (1910-1959; reprint in 6 volumes, Gloucester, U.K.: Alan Sutton Publishing, 2000), volume III, page 312. Hereinafter cited as The Complete Peerage. From 31 August 1850, her married name became Bligh. After her marriage, Lady Harriet Mary Pelham was styled as Countess of Darnley on 31 August 1850. [S6] G.E. Cokayne; with Vicary Gibbs, H.A. Doubleday, Geoffrey H. White, Duncan Warrand and Lord Howard de Walden, editors, The Complete Peerage of England, Scotland, Ireland, Great Britain and the United Kingdom, Extant, Extinct or Dormant, new ed., 13 volumes in 14 (1910-1959; reprint in 6 volumes, Gloucester, U.K.: Alan Sutton Publishing, 2000), volume III, page 267. Hereinafter cited as The Complete Peerage. [S6] Cokayne, and others, The Complete Peerage, volume III, page 311. [S6] Cokayne, and others, The Complete Peerage, volume III, page 268. He was styled as Viscount Cornbury between 1674 and 1709.1 He matriculated at Christ Church, Oxford University, Oxford, Oxfordshire, EnglandG, on 23 January 1674/75.1 He gained the rank of Lieutenant-Colonel in 1683 in the Royal Regiment of Dragoons.1 He held the office of Member of Parliament (M.P.) (Tory) for Wiltshire between 1685 and 1687.1 He was Colonel of the Royal Regiment of Dragoons between 1685 and 1689.1 He was Master of Horse to Prince George of Denmark between 1685 and 1690.1 In 1688 he deserted the King, along with as many troops as he could induce.1 He held the office of Member of Parliament (M.P.) (Tory) for Wiltshire between 1689 and 1695.1 He held the office of Member of Parliament (M.P.) (Tory) for Christchurch between 1695 and 1701.1 He held the office of Governor of New York between 1701 and 1708.1 He held the office of Governor of New Jersey between 1701 and 1708. He succeeded as the 3rd Earl of Clarendon [E., 1661] on 31 October 1709.1 He succeeded as the 3rd Viscount Cornbury, co. Oxford [E., 1661] on 31 October 1709.1 He succeeded as the 3rd Baron Hyde of Hindon, co. Wilts [E., 1660] on 31 October 1709.1 He was appointed Privy Counsellor (P.C.) on 13 December 1711.1 He held the office of Envoy Extraordinary to Hanover between May 1714 and August 1714.1 His last will was dated 30 March 1723. [S6] Cokayne, and others, The Complete Peerage, volume I, page 413. She succeeded as the 10th Baroness Clifton, of Leighton Bromswold [E., 1608] on 12 February 1712/13, suo jure.2 Her married name became Bligh.